There's a photo in Cook's Uganda Memories that shows him as a young man at leisure in his Kampala home. He wears a suit and tie and sits on a folding chair at a table with teapot and cups. The house itself, however, is just like this one. So was Cook's first hospital, which opened in 1897 and was thatched, though the floor plan was a long rectangle and the thatch did not come to the ground; instead, the walls were split reeds that allowed some ventilation. Three years later, Cook built a replacement hospital with solid walls of whitewashed mud and wattle. 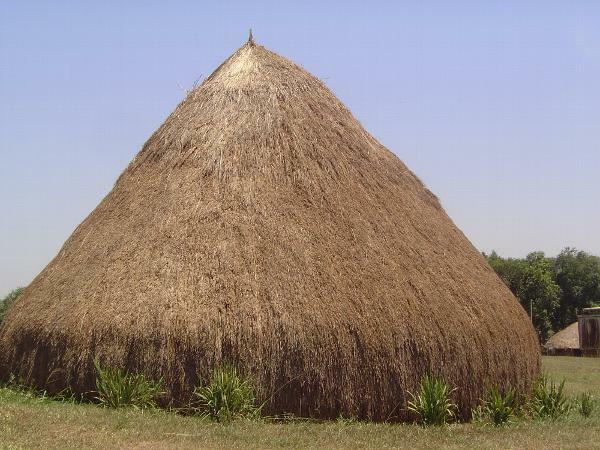 It had windows, too, but the building was roofed with 112 tons of trimmed thatch. Two years later, a lightning strike destroyed it, and a third hospital went up, this one without thatch and instead with sun-dried brick under an overhanging roof of corrugated metal on sun-dried brick. So did the Baganda hut begin its long decline and eventual near-disappearance.